Placing the Royal Archives’ substantial Georgian papers collection online, for anyone anywhere in the world to access, marks a transformation in the interest, study and understanding of this crucial period in British and world history. Using 21st century technology to shine new light, colour and context on history, the portal will allow a reappraisal of, and bring new insights to, a complex, engaged polymath and highly informed Monarch. George III is often labelled as ‘mad’, or the King who lost America. Over the next four years, the Georgian Papers Programme – collaboration between Royal Collection Trust and lead academic partner King’s College London – promises to reveal many more dimensions to Britain’s longest reigning King and his family. A BBC Two documentary George III – The Genius of the Mad King has followed the early phases. 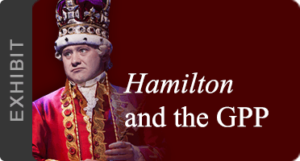 On January 28, 2017 a new global online portal will be launched officially, allowing the public and scholars alike a unique window into the life, reign and times of King George III, his impact then and his continuing influence on today’s world. 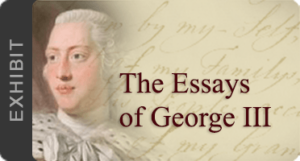 It marks a major milestone in a five year project to enable anyone with an interest in George III to discover the intricacies of his life, reign and the contemporary times. By 2020, the portal www.royalcollection.org.uk/georgianpapers will enable people to enter a remarkable collection of 350,000 papers from the Georgian period, only 15% of which have ever been published before. They include intimate letters between The King and Queen Charlotte, Household bills, menus, as well as copious letters between The King and his government, his many essays – including on despotism – meticulous, detailed notes about the war in America, and lucid, calm letters to family during his bouts of illness. Since 1912, the papers have been stored, with restricted physical access, within the Royal Archives in Windsor Castle’s Round Tower. From January 28, the first 33,000 digitally photographed pages will be published online and open to anyone to access, enabling academics, students and history lovers worldwide to see George III, Britain’s longest reigning King from 1760 to 1820, from new perspectives. The Georgian Papers Programme (GPP) is a partnership between Royal Collection Trust, lead academic partner King’s College London and international participants, including primary U.S. partners the Omohundro Institute of Early American History & Culture and William & Mary, as well as other key U.S. institutions such as the Library of Congress, Mount Vernon and the Sons of the American Revolution. With Her Majesty’s full authority, the project is part of Royal Collection Trust’s objective to increase public access to and understanding of primary source material held in the collection. It follows the success of the digitisation of Queen Victoria’s journals in 2012, which has encouraged wide public appreciation. The GPP was launched in the presence of Her Majesty The Queen at Windsor Castle in April 2015. Since then, acclaimed documentary producer John Bridcut and writer and presenter Robert Hardman have been following the initial stages of the project. Revealing that George III had a network of private agents. One, code-named Aristarchus, a ‘Georgian James Bond’, asking for payment for the intelligence that the French were plotting to assassinate the King as he walked at night in The Queen’s Garden. A draft of Abdication, covered in blotches and scratchings, during the political crisis of March 1783 amid the difficulties in forming a Government. It was never deployed. An instruction manual on Kingship written by George III’s father for his 10 year old son. George III’s drawings and calculations of the Transit of Venus across the sun on June 23, 1769 and his – accurate – forecasts of further transits in 1874 and 2004. Sir Simon Wessely, President of the Royal College of Psychiatrists and Regius Professor of Psychiatry at King’s College London , tells the programme that we may never know exactly what was wrong with George III, it may have been hypomania, but breakdowns often came amid turmoil at home, including the premature death of his youngest daughter Princess Amelia from tuberculosis. Arthur Burns, Professor of Modern British History at King’s College London and Academic Director for the Georgian Papers Programme at King’s, says that the papers reveal how George III’s exercise of Kingship reflected his strong sense of commitment to the nation and both self-examination and serious reflection on what it mean to be a ‘good King’. Andrew O’Shaughnessy, Professor of History at the University of Virginia and the first of five visiting Sons of the American Revolution GPP Professors to visit Windsor, talks about papers revealing George III’s ‘voracious interest’ in every detail of the war in America, from how many soldiers and blankets were required, to recording every detail of the French fleet, including canons, in his own hand. He explained that the GPP academic partners have established a series of more than 50 visiting graduate and undergraduate fellowships and five visiting professorships, based at the Royal Archives to support the programme over the coming years. In the last 12 months, the Round Tower floor has been refitted to allow the digitisation, cataloguing and conservation work for the Georgian Papers Programme to begin. Further refurbishments have created a new research room, open five days a week, increasing capacity to support external research from 500 hours a year to 6000 hours a year, a twelve-fold increase. George III – The Genius of The Mad King will broadcast on BBC Two on Monday 30th January at 9pm, available to catch-up on BBC iPlayer for 30 days.